Furniture of this type, American Empire, appears to have originated in early 19th century America, and flourished until around the time of the Civil War. Empire furniture was built in more or less the same territory as that occupied by the log cabin, as far north as Pennsylvania, as far south as Georgia, as far west as Texas and Oklahoma. While there are distinct elements of Greek Revival in some Empire pieces, the front posts ornamented with classical columns or half-columns, others have carved barley-twists which are not classical at all, but English. Black cherry is the primary wood in both pieces, tulip poplar secondary. The carcases have mortice and tenon frameworks, panels are beveled on the inside, drawers have hand-cut dovetails. The main posts, which are two inches or more on each face, show definite marks from a scratch awl on the inner faces. Pinned tenons are not in evidence, so there must have been a glue-pot in use, and there is ample evidence of competent joinery, carving, and wood-turning to impress anyone who has ever attempted such work. There is no veneer, and no evidence of machine work in either of these pieces. The less ornamented Empire furniture might be considered vernacular (perhaps even in the original etymological sense), it doesn’t seem to appeal to museum curators if a more decorative piece is available. A bit of history, here. In July 2010, I stopped in at Historic Arkansas Museum to talk with Andy Zawicki, the museum’s conservator. At the time, I was involved in stabilizing the piece on the right and had discovered something I thought interesting. Andy couldn’t add anything, and ushered me into Swannee Bennett’s office. Thus began the blacksmith shop fiasco. In their books Arkansas Made, Bennett and Worthen listed cabinetmakers in Arkansas by county. They also show photographs of several pieces of furniture of similar style, built by cabinetmakers in diverse locations. Bennett, in our 2010 conversation, suggested that I explore the Museum of the Early Southern Decorative Arts. I did, as far as I could navigate their website, but found nothing of relevance. Wallace Nutting, in his Furniture Treasury, shows precisely one piece, no. 280, of Late Empire (1830). It is a four-drawer chest, similar to the piece on the left but considerably more ornate. The piece on the right has a shipping label painted on the back, to Sedalia, Indiana. I’m guessing that it originated somewhere near there. I finally got these pieces where I could photograph them, never had the two side-by-side before. The piece on the left must have had bun feet at one time; the feet have definitely been sawn off, and now the proportions seem all wrong. Notice that the back posts were turned. This entry was posted in carpentry, furniture. Bookmark the permalink. My wife loves Empire style. 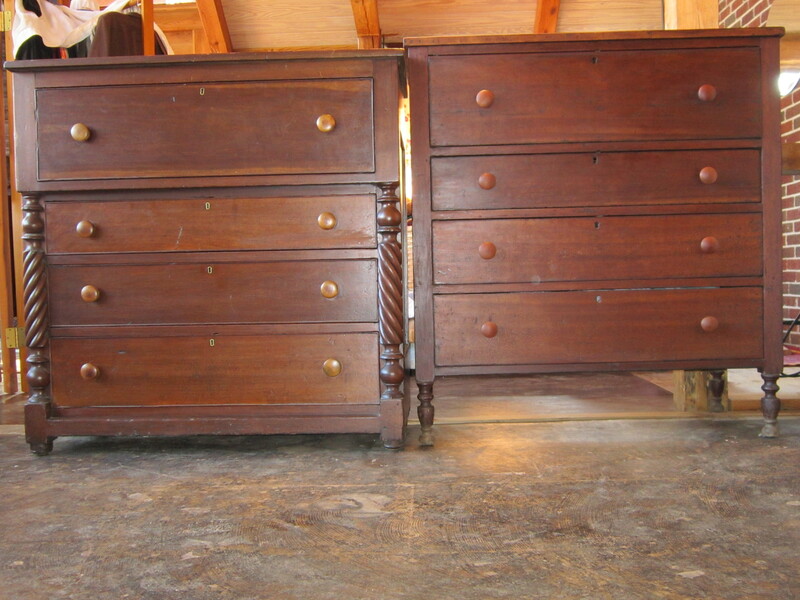 We have three nice pieces – two bedroom chests of drawers and a credenza with a coopered lower door. At some point in time, I need to repair the drawer bottoms on my wife’s chest of drawers; they have about 1/4″ rubbed off the bottoms where they’ve been running on the frame for 100+ years. I agree, that dresser on the left looks a bit off with the feet removed. I like the Empire style, but I prefer Eastlake, if I have my druthers. I have a wonderful drop-front writing desk and two chests of drawers in the Eastlake style. Oh, and three days ago a co-worker gave me an Eastlake cane seat side chair that just needs to be reglued to be in great usable condition. We also have a few Shaker-style pieces – some nightstands, a simple 4-poster bed (that one is not antique, but older Ethan Allen, from when they made quality stuff). Some of my favorite pieces are an Eastlake chest of drawers and a Shaker-style nightstand that both have Knapp joinery on the drawers. The joinery has stood the test of time – 120 years later and they’re all still as tight as they were the day they were made! I grew up in a house full of eclectic antiques, so it doesn’t bother me at all that our furniture doesn’t match. My wife agrees. Her only request is that we avoid oak; for some reason, she doesn’t like antique oak furniture. But sticking with Empire, Eastlake, and Shaker furniture, we generally don’t have a problem with that. Great post! Love reading about furniture. Eastlake, with that nice carving, has to be solid wood. The later Empire is all showy veneer, I avoid that stuff. I prefer to work on solid wood, replacing or repairing old veneer is really difficult. Oak has a tendency to splinter and chip on the corners, more so than the other hardwoods.